A modernized DP-64 grenade launcher uniquely designed to keep enemy frogmen, saboteurs and pirates away from ships and important sea maritime installations, such as oil rigs, has gone into mass production in Russia. The two-barreled DP-64 “Nepryadva” grenade launcher has been supplied in limited-edition batches to various sections of the Russian Armed Forces, including the Marines, special units of Russia’s Federal Security Guard Service, maritime Border Patrol vessels and FSB coast guards. 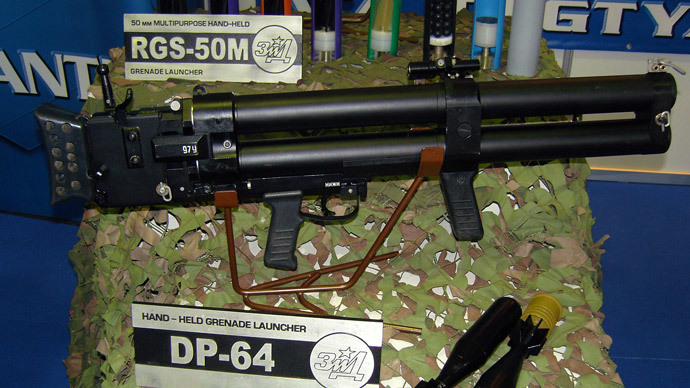 The DP-64 grenade launcher enables even a small unit to maintain a secure protection against enemy divers of anchored ships, maritime installations and other important offshore infrastructure facilities. The launcher can be fired in difficult conditions, such as from a helicopter. It can launch a grenade at a distance of up to 400 meters and the projectile could be set to explode at a designed depth. Non-lethal grenades with tear gas could be used to avoid undesired casualties. Designed and produced by JSC Bazalt at its Degtyarev Plant in Russia’s city of Kovrov, the first version of this grenade launcher first appeared in 1989 and was adopted a year later, though still remaining a rare piece of armament. Last year the Russian Navy ordered a large batch of DP-64s, thus paving the way for the mass production of the weapon. “The DP-64 is in mass production now. In 2014 we got a considerable order from the Defense Ministry, I can't disclose details, but this is to supply our Navy,” Pavel Sidorov, head of the JSC Bazalt Science and Engineering Department, told RIA Novosti. Sidorov is currently attending the IDEX 2015 international defense expo in Abu Dhabi, UAE, as the company's official representative at the event, where the DP-64 is being presented alongside other Russian-made weaponry.